View of the second central supporting pillar (the pillars are numbered 1 to 7, from south to north) of Leichenkeller 1 of Krematorium II, looking south/north, and part of the east side of the ceiling. In the center are the emplacements of the third and fourth dummy shower heads. 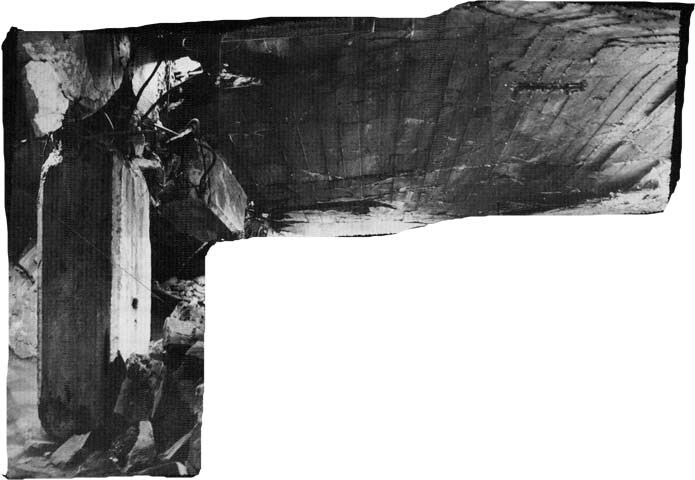 On the extreme right are the remains of the wooden battens stapled to the ceiling to which the wooden fresh air ventilation duct was fixed. Close-up view of the concrete ceiling, appeared in 1943-44, bearing the grain marks of the wooden formwork. 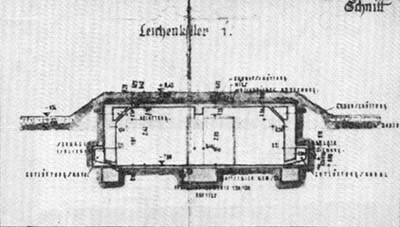 Cross-section of Leichenkeller 1 of Krematorium II taken from Bauleitung drawing 934, showing the arrangement of the upper ventilation and lower air extraction ducts, originally planned for a morgue. 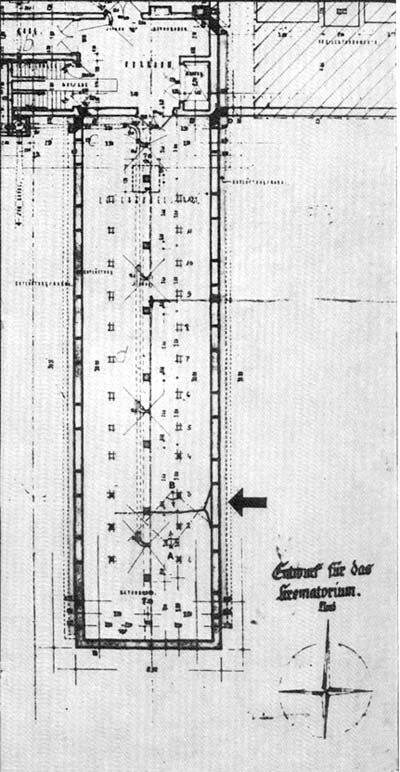 Detail of Leichenkeller 1 of Krematorium II taken from Bauleitung drawing 932, showing the position of the photographer for Photos A and B. The arrow indicated the entrance through which it is still possible to penetrate the ruins of the gas chamber. Numbered 1 to 12 is the eastern row of dummy showerheads. Those in black are visible, those left white supposed (though 8 or 9 is also visible, but access is difficult). There were twelve others symmetrically placed in the western half. On this drawing, Leichenkeller 1 is not yet fitted out for its homicidal use: the entrance door is still a double door opening inwards and the drains are still connected to the general drainage system of the building, which could have caused accidents after gassings, with hydrocyanic acid gas rising to the ground floor.